The world’s great Philosophers after critically studying the significance of water in the daily sustenance of humans as they patch to find it, hold the fact that this natural substance is the main nourishment of life. This accepted fact has become the universal truth and its shortage or inaccessibility or affordability has become a global concern. As the population continues to grow, the search for water not mentioning it purification and hygiene unabatedly continues to hit the world. Many qualities have been couched or converted about water and all these when critically looked at, it worth its meaning, and candidly there is nowhere in the world, where the use of water is not visible or on the contrary its shortage creates an herculean problem which can be easily seen on the faces of the victims. The trek for pure water is slowly becoming very difficult for the world population breeding in bad sanitation which at the end gives birth to the acute health hazards. Pure drinking water and proper sanitary system are like two bed fellows and the lack or shortage of one leads to unwanted problems, forms part of the world’s Human Development Index which is globally now an impetus used to rate a country or nation. Pure drinking water and improved sanitation is the backbone for proper health system and better living standard, as scientist have confirmed that a healthy body system can ably resist any incoming virus that may wants to invade the body. Meaning, especially in the third world countries (predominantly Africa) communities has the zest for pure drinking water and good sanitation many of these deplorable community despite the frantic efforts of the government suffers the brunt for proper water. Though some have attributed such mishaps to the location of such community but the underlying note is that access to proper water and sanitation for every human being is a must and it absence is a violation and the consequences could not over emphasized, taking into cognizance communities like the KrooBay, Moe Wharf, Big Wharf, Sorie Town, Sumaila Town among others. It will be interesting that it is opined that water comes down from the hill up to the flat land, interestingly in some of these communities it is the reverse as the hillside areas which supposed to spill fresh water are the most affected and most deprived, investigations have shown that any outbreak will be disastrous especially for the children and lactating mother. Taking a leg walk to the Sorie Town Community, back of the Pademba Road Maximum Prison, underlying the foot of the Fourah Bay College in the western area surrounded by Dwarzak Community, Sumaila Town Community etc., the patch for pure drinking water is alarming and touches the hearts as little children, pregnant women and others carrying containers trekking miles for water. It has been like this for the past twenty-five(25) years now in this community leaving people somber each day. The community is predominantly dominated by the third largest group in the country situated at Ward 375 Constituency 106 in the Central part of Freetown. The accessibility and affordability to pipe borne ware to them is impossible. Every year the period between December and the next rainy season is met by hordes of men, women and children scampering helter skelter at every hour of the day and night in search of clean drinking water. When it rains the community piles all their utensils for water to easy the day’s trek, no matter how much. Investigation revealed that the community initially source water from bore holes which they normally used for domestic purposes and trek miles in search of drinkable water. According to information, some people who could not make it for drinking water had no option but to use those bore holes water to drink. ‘We’ve used to the water and we preferred them than the water. In fact it ease the burden of trekking miles away for a container or bucket of drinking water’, an old woman told me. She said, her age would not allow her to cover those distance for pure drinking water unless from the bore holes few yards from her house which she uses and she never complaint about any illness. Mamie Ndeamor, further said, prior to this period when she and her late husband first settled in the community water was not a problem as there was fresh and good water running from the hill top. The surrounding communities were even jealous of Sorie Town as they usually come to fetch water from the community. It was because of the sufficiency of water in the community, lures inhabitants to engage in farming as most of the fresh leaves and crops were coming from Sorie Town. Appallingly as things unraveled and with the influx of people putting structures everywhere without proper planning and preservation of the catchment areas the water has dried up and the site is almost like a dumping site oozing out little water. It is sad, a young girl intimated this press, that during the dry season when the bore holes and dug out wells is dried people queued in those areas to fetch water. Faced with such alarming situation, the community which is almost over populated dug out series of wells approximately closed to the narrow gutters for water and most of these wells the water there are not hygienic for human being. This menace affects most of the youths and school going pupils who had to tote a gallon or more depending on the size of the family everyday up and down the hill. For the school going pupils, they had to wake up very early in the morning in search of water and sometimes missed their first periods in class, whilst other get hits by motor bikes, for the young girls even get pregnant along the line since they have to trek miles and hours to fetch water before and after school. It is a serious problem in the community. 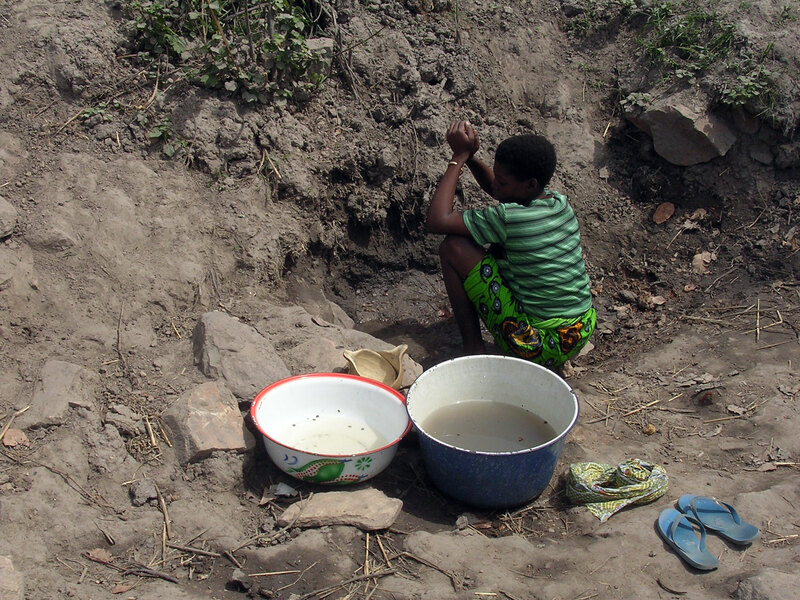 Joseph Turay, a middle age man, said the water problem in the community is not a new thing as it has been the usual talk and they have made many moves for an improvement but to no avail. He added that the politicians who normally visited the community are au- fait with these problems but have failed to help as they usually make vague promises. Prior to this period, a certain politician started the construction of a proper water system, but ceased to continue the work because the community refused to vote him as honourable Member of Parliament. ‘Basically, the project was like abate for the community people undertaken by the then politician’ he emphasized. The Donwell, which is the major source of water in the community, was constructed this year by on Mr. Gerbar to salvage the problem. The well though below the hygienic standards is always over crowded as community people both young and old had to throng with their containers to fetch water back home in order to save time off the miles trek for water. But the million question that runs down the mind is how pure is the water since it is coming from an open well, is it normally treated by the community or the Health and Sanitation Ministry?. Suffice to say that many of our wells in the different communities round the country only received treatment when there is an outbreak, like the cholera outbreak that engulfed many lives. The plight faced by the Sorie Town Community, is also visible in the other surrounding communities like the Sumaila Town, Dwarzak among others, where people had to walk miles off their houses to fetch water for diverse purposes. Visiting these communities will you will feel poverty, therefore one would not bother to talk about the purchase of packet water. It will interest readers to note that despite the suffering of the people, there has not been any proper community mobilization and advocacy programmes put in place for pure water system in the community, neither from the government nor donors. And the looming danger is, had there been any outbreak of disease likes the cholera which had left nearly many homes in tears, it will be disastrous. Secondly, because of the unchecked encroachment of catchment areas the country will soon be faced with serious drought and there is also the possibility of landslide in these areas if nothing is done speedily. Meaning, it is not just about water insufficiency but the possibility of herculean problem hovering the communities in this country. For instance, the slums areas, KrooBay, Big Wharf, Moa Wharf, Kanikay Wharf among others where people are using sticks and stones to bank the sea water, no pure drinking water, no proper sanitary system etc. had there been any flooding as happened elsewhere in the world it will be disastrous. 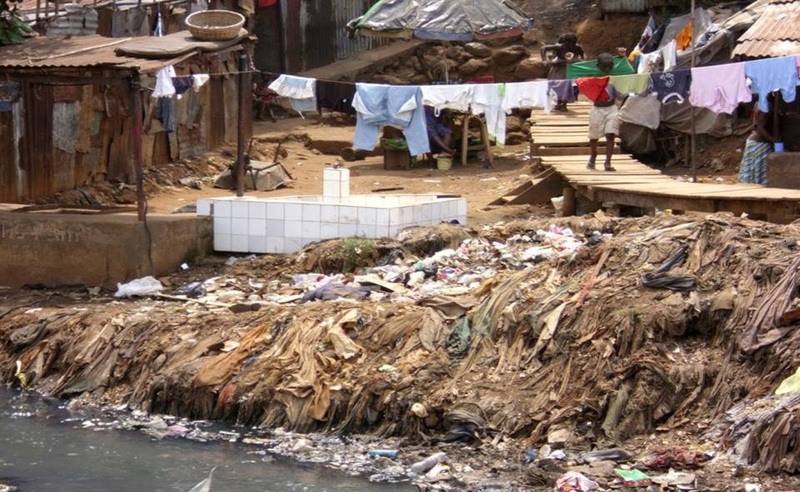 Coming back to my case study, which is Sorie Town, due to the unhygienic water, dug close to gutters and the poor sanitary system, the most prevalence disease in the community is Typhoid and Malaria. For the little children, they most often died of diarrhea and vomiting, not to mention pregnant women who normally gave birth under strenuous conditions. Many of those, whom this author was fortunate to run through (especially school going pupils) expressed their frustration and disappointment on the undue suffering they are faced with in search of pure water, which seriously affects their studies. It is obvious, that there is an urgent need for government through the line Ministries to come up with a comprehensive programme of action to adequately address the crying needs affecting the hillside and hilltop communities. ‘What we need is for government to take on Water and Sanitation with a sense of urgency and make it a national concern’ a young school girl emphasized. 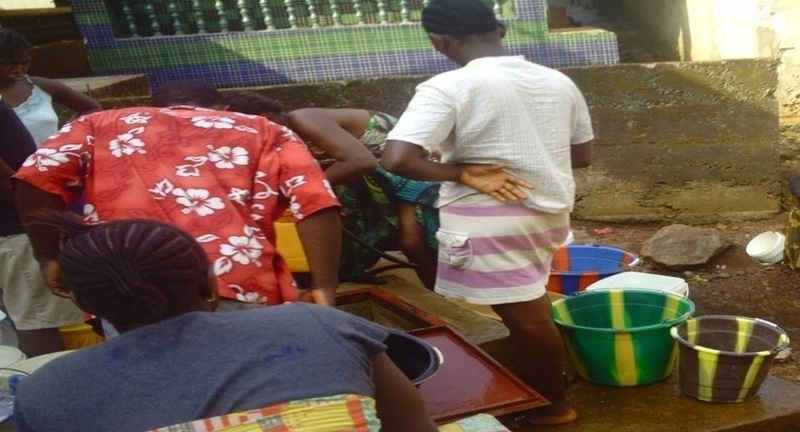 This article is produced by Water and Sanitation Media Network, Sierra Leone Chapter in partnership with West Africa WaterAid and Water Supply and Sanitation Collaborative Council .